Yes another hand wash. These moves are always popular crowd pleasures and on clinics everyone wants to get involved in some water tickling. This is the front roll or front loop variant and it has its roots firmly placed in the more traditional popped front loop nose grab transition from yesteryear as featured in Issue 31! There is quite a lot going on in a short amount of time, so you’ll not have the luxury or hindrance to worry about flying the kite, it’s more pop and go and until you’ve nailed a few the kite will seemingly dictate when everything happens. This is another move that will be far easier to learn on a bigger kite and much trickier on a 7m. Your approach into this is similar to that of a dark slide or back roll hand wash if you already have those nailed. If not fret not, your principal aim is to stay low whilst maintaining your edge. Normally to pop we explode upwards and naturally as you sit you will bend your knees and come up over the board. So get your cheeks down low whilst keeping your edge. This way you’ll have an edge to kick up and off, whilst being low enough to get your hand in the water. You can see the rider approaching with his kite about 11 o’clock, bar trimmed out so that he can keep tension on the lines with an extended arm, plenty of speed and he is sitting low but still with plenty of edge. From here the rider takes his front hand off the bar, turns further into wind to check his speed and very gently pulls the bar in with his centered back hand. Timing wise your moment to go is the same in all these pop trick transitions, you must go early, that is to say before you feel the kite lift. As long as you pre-empt the lift your kite is less likely to fly too far back in the window and you’ll be able to stay low. In Pic B. The rider really kicking off and against his edge, not up. This fortunately is the standard kick off fees forward rotation but here you must exaggerate the action. The rider leans forward and stretches his free front arm out in front of him as he kicks. This will both initiate the front roll and plant his hand into the water. It is important to get your hand out in front as you’ll soon overtake it without the resistance and drag it’ll produce once buried in the water. 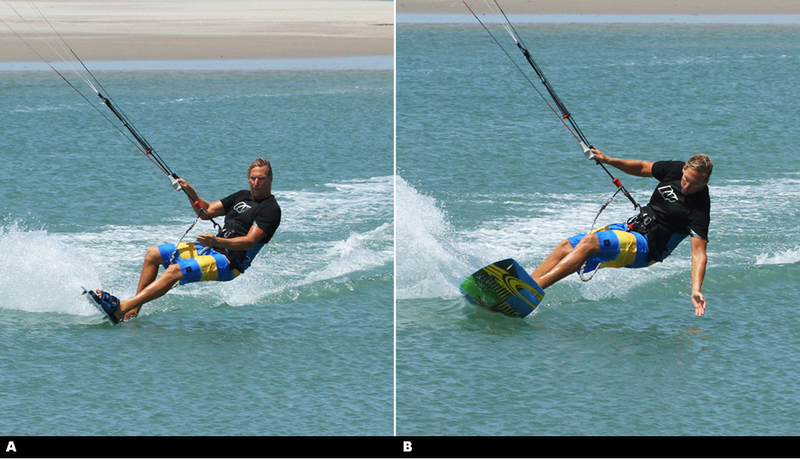 Here in Pic C. you can see that the rider kite has still not reached 12 o’clock and he is already well into the move. He has his hand in the water and is making an effort to resist by keeping his arm locked out. Simultaneously the rider keeps the bar in and as such the kite will be slowly drifting back whist The rider pendulums underneath. As mentioned earlier there is an element of just going with this move as you learn it. However if you can you should try and invert yourself as much as possible to get some extra style points. You’ll see some folk banging these moves out totally straight and stiff. As your head is down it is a matter of getting your hips, feet and board up, and the simplest method is to keep your hand firmly planted and straighten your legs. With the drag from your hand they’ll be forced up! You can see that the rider pushing his feet up in an attempt to get inverted. Worth noting though is that his hand is only just in contact with the water so he is about to lose resistance and his opportunity to get fully upside down. Whilst trying to straighten up the rider has to keep the bar in and be ready for the moment that he gets lifted and his hand releases from the water. 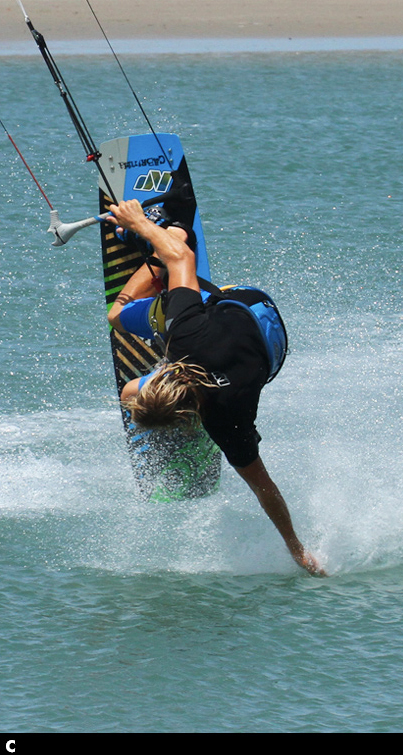 Is Dive & Land Pic E.
Once you feel yourself lifted, this is your cue to finish your front rotation as the kite has passed through 12 and is effectively jumping you up off the water. If you can get yourself around, then you’ll be able to see where you’re likely to land and balance yourself against any awkward pull from the kite. Looking at Pic E. you can see that the first two things that the rider has done are allow his legs to drop and get his free hand back on the bar, as both these movements will give him more control of the situation. By dropping his feet the rider has his undercarriage and landing gear down, and with two hands on the bar he can better control how quickly the kite is moving. 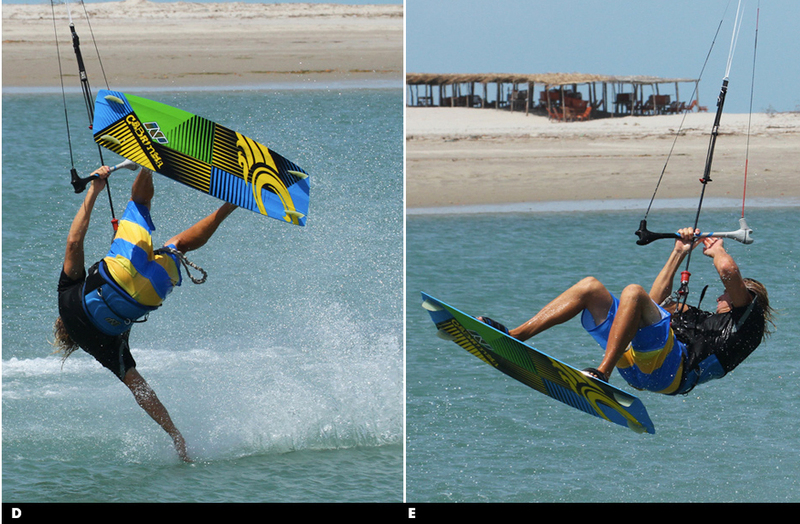 The rider is also looking back and down wind, so that he can turn his body and board to where he should be landing. What he does now will depend on how far back the kite is and how far out the rider has pendulum. If the kite is still relatively high the rider will dive hard with his new front hand (the right one) to pull himself out of the move. If the kite is quite far behind the rider will have to dive it harder, aiming for a late kite loop, so that he’ll have the power to keep moving once he lands. Whilst learning this we recommend that you go for the first diving option, as it’s better to get wet and water start than get thrown around backwards. It’s a good idea to start off with some gentle popped front loop transitions with both hands on the bar to ease you into the kite timing and see how far back the kite goes. If it is going a long way back go earlier. Once you feel confident get low and give it a go, not much can go wrong as you shouldn’t be more than an arm’s length off the water. Main problem that you’ll have is the kite ending up too far behind you, so go early and keep your edge whilst you get low, and let the bar out a bit to stop the kite drifting too much. You may also have trouble getting the hand in and keeping it planted in the water. Really reach forward and throw yourself down into the water. Once it’s in resist the pull against it. This may take a few goes to get your head around.